BY DANNY McCLOSKEY: Emmylou Harris has defied the odds of location, location, location when she paired with Gram Parsons to develop cosmic American Music shortly after being a waitress in a Baltimore diner. She broke industry rules that rock and country could not and would not meet when her first albums were received by both communities, and where her presence still gets attention. Very few times can you mention Emmylou Harris without another chiming in, at least one, with an ‘I love Emmylou’. That is the reason she has spanned forty years since she shared microphone duties with Gram on his solo debut, GP. She makes everyone feel like she is their artist; their find. Emmylou Harris has developed and groomed musicians and styles throughout her career, with highlights in her work often honored by the Grammy Awards as Best Contemporary Folk Album. Whether it is folk, country, rock, gospel, classic country, Americana or Roots rock, Emmylou Harris is a confident guiding mother to every song, style and band smart enough to clue her into recording dates. 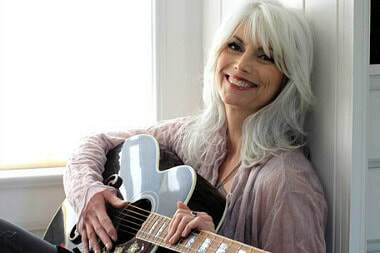 Everyone has a reason for the love of Emmylou…here are Ten Reasons Why We Like Emmylou Harris. 1. “Love Hurts” – Gram Parson and Emmylou Harris (from the album Grievous Angel) - This track was slated for album number two, Grievous Angel. Gram Parsons passed away before the January 1974 release date. Contemporary critics of the time didn’t feel it held up to previous efforts but we are still talking about it in 2014….something must have worked. “Love Hurts” by Gram and Emmylou is intimate. The vocals will walk away with you, stake a spot in your heart and move in after the first date. 2. Feelin’ Single, Seein’ Double – Emmylou Harris (from the album Elite Hotel) - 1975 closed out the year with a second release in December for Reprise Records new signing Emmylou Harris. Elite Hotel planted one foot in rock’n’roll and one foot in country. “Feelin’ Single, Seein’ Double” carries the added punch of standing up for the girls having the same rights as the boys when it comes to making bad decisions fueled by alcohol, dim lights, thick smoke and loud music. The fuel for this song comes from Emmylou’s Hot Band, featuring recording and touring members of the Elvis Presley’s band (James Burton, Emory Gordy, Glen D. Hardin) and Rodney Crowell. 3. The Ballad of Emmett Till (from the album Hard Bargain) - No gaps or seams have ever appeared in the recorded output of Emmylou Harris. “The Ballad of Emmett Till” is from her 2011 release, Hard Bargain. The Emmylou Harris-penned tune allows its singer to become another soul, and write another’s pain, from beyond its earthly life. Emmett Till was a young black man from the north visiting southern relatives. His ballad reveals the horror of times past, the song reminding that those times can never be far enough away. 4. “Luxury Liner” – Emmylou Harris (from the album Luxury Liner) - Her 1997 album with the Hot Band, Luxury Liner, has been Emmylou’s bestselling album. Her back-up band was living up to its name in a big way. “Luxury Liner” stretches out for a cruise over a train track beat. Emmylou is out searching for her baby on board ‘40 tons of steel’. She may think about giving the twang in the tune a go as it swears its allegiance throughout the track. 5. “Boulder to Birmingham” – Emmylou Harris (from the album Spyboy) - The album title is from the touring band that backed Emmylou Harris during this period. Spyboy is a live album and lets the band stretch each song musically. Emmylou duets with American treasure Buddy Miller on this version of her song. Emmylou gets a great deal with Buddy as the match for her vocal comes from both Buddy’s pipes and his guitar. 6. “To Know Him Is to love Him” – Dolly Parton, Emmylou Harris, Linda Ronstadt (from the album Trio) - Three of the top vocalists in 1987 joined together to record “To Know Him Is to Love Him” and other tracks as Trio. The tune was originally recorded by The Teddy Bears, written by Phil Spector, and performed by the only group that Phil ever played in as a member. Even with microphones shared with voices like Dolly Parton and Linda Ronstadt, it is Emmylou Harris who owns this track. 7. “Hanging Up My Heart” – Emmylou Harris and Rodney Crowell (from the album Old Yellow Moon) - Emmylou joins up with former Hot Band member Rodney Crowell on a co-headlining gig in the pair’s 2013 release, Old Yellow Moon. Hot Band members James Burton and John Ware guest on HB alumni Hank Devito’s tune, “Hanging Up My Heart”. 8. “Deeper Well” – Emmylou Harris (from the album Wrecking Ball) - Daniel Lanois produced and U2 drummer Larry Mullin, Jr. guested on Wrecking Ball. The album struck out into new territory for Emmylou Harris as she incorporated the use of sonic’s into her natural roots music without ever sacrificing herself or her songs. Emmylou received a 1996 Grammy (Best Contemporary Folk Recording) for her efforts in developing Americana as its own genre in “Deeper Well”, a co-write with Emmylou, album producer Daniel Lanois and David Olney. 9. “This Is Us” – Mark Knopfler and Emmylou Harris (from the album All the Roadrunning) - It is not adding Emmylou Harris to a track’s vocals that make it a particular genre. She walks into styles and lets them do their own thing while she sings as Emmylou Harris. “This Is Us”, with Dire Straits’ Mark Knopfler, turns the pages on the scrap book pictures of a life together, sprawling out of a caffeinated roots rhythm. 10. “Two More Bottles of Wine” – Emmylou Harris (from the album Quarter Moon in a Ten Cent Town) - The thread that has trailed through the music of Emmylou Harris is made of the joy she brings to the microphone. That is her style. She adds vocals to music that she feels is a part of her voice, comfortably digging Roots through grounds of Classic Country and Rock’n’Roll as she does on this 1978 release with of the Delbert McClinton tune “Two More Bottles of Wine”.